When a person makes a life-altering ethical decision such as committing homicide or blowing the whistle on government corruption, the astrological culprit is almost always a Pluto-to-Pallas transit representing pressure or crisis (Pluto) of one's decision-making faculties (Pallas). Sometimes, particularly in the case of suicides, the trigger is a discordant aspect from Jupiter to natal or progressed Pallas. In this sad case, we have both. Transiting Pluto is sextile Cornell's Pallas and transiting Jupiter is semisquare his progressed Pallas. 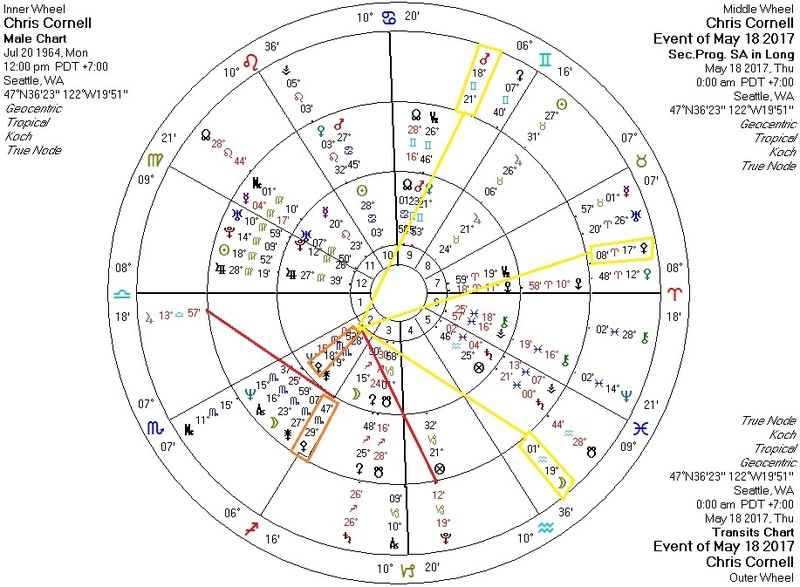 Transiting Mars, Moon, and Pallas all form aspects to Cornell's Pallas as well, suggesting that his decision-making faculties were under severe astrological stress.